Kim Knox Beckius is a Connecticut-based travel writer whose passion for New England inspires everything she does, whether it's riding a giant, inflatable lobster in her wedding gown; naming her daughter so she shares initials with L.L. Bean; or sending free fall leaves in the mail to autumn lovers around the world. 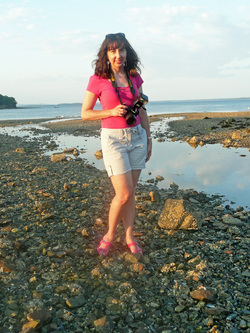 She has produced a highly visible Web site on New England Travel for About.com for more than 14 years. She is the author of seven books including Voyageur Press's Backroads of New York and The New England Coast, as well as New England's Historic Homes & Gardens, published by Union Park Press. Her writing and photography have been featured online and in print by numerous outlets including USA Today, Aer Lingus Cara Magazine, Travel & Leisure and Grace Ormonde Wedding Style. She is frequently called on by television, radio, and print media outlets to discuss travel and events in New England. She has spoken at industry conferences including M2Moms: The Marketing to Moms Conference, the New York Times Travel Show and the Vermont Travel Industry Conference. She also speaks at libraries and to organizations and businesses on topics related to travel and wellness. Beckius lives in a remodeled and expanded 1880 farmhouse in Avon, Connecticut, with her husband and 10-year-old daughter, but they have their most memorable family moments when they're on the road.